And so, the vicious circle continues. How can you improve your interview game when no one is telling you what you’re doing wrong? While there may be different factors at play, Glassdoor Senior Talent Acquisition Partner Jamie Hichens sheds light on eight red flags that can knock job seekers out after the first interview. “Arriving to your interview at least 10 to 15 minutes early and bringing extra copies of your resume are also a must,” adds Hichens. 2 You didn’t convey enough passion. 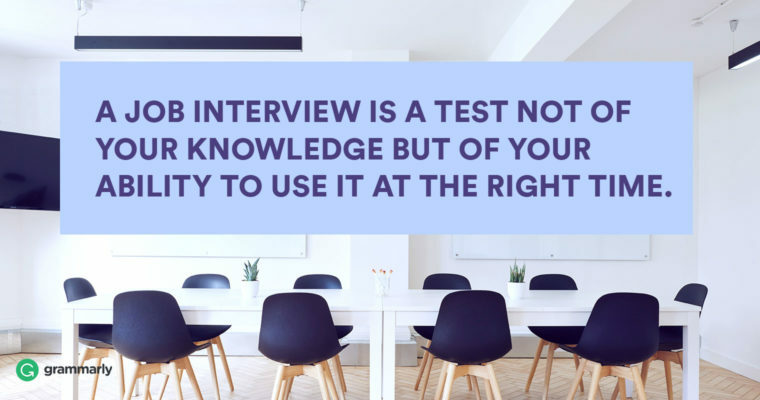 The first interview is an incredibly important way for an interviewer to gauge whether you are truly interested in working there as opposed to just looking for any old job. That’s why Hichens says it’s “crucial to prepare a solid explanation as to why you are interested in the company and position.” Ask yourself: What first attracted you to this company? What about the company’s mission/industry resonates with you? How does this position fit into your professional journey and your career aspirations? 3 You were too passive. Along with preparation and passion, make sure to stay proactive throughout the entire interview process. Interviewers want to see you walk the walk, and asking insightful questions and sending thank you emails are great ways for you to show them just how interested and responsible you are. Hichens is always impressed when candidates ask interviewers questions that help them better understand the job. Bring a notebook and take notes on their answers. After you finish your first interview, Hichens says it is vital to send a thank you email to your interviewers within 24 to 48 hours. “Hiring managers always share a candidate’s thank you email with me when they receive one.” Handwritten notes can go far as well, although only as a supplement to thank you emails. 4 You were too aggressive. If being passive is not your problem, then be wary of having too much of a presence . Acting too eager or arrogant will give the interviewer the impression that you are hard to manage. During the interview, your hyper-excited or know-it-all tendencies may compel you to cut the interviewer off mid-question, but avoid interrupting at all costs. It says a lot more if you take a moment to develop a well-thought-out answer with concrete examples. 5 You failed the physical first impression. As for interview attire, Hichens recommends always dressing a notch up from the dress code (and cleavage is never appropriate). “Avoid distracters such as large amounts of makeup/jewelry, strong perfume or flashy hair so that the interviewer can truly focus on what you’re saying.” And lastly, always practice proper hygiene protocol. 6 You didn’t show them you’re here to stay. 7 You were a poor culture fit. When it comes to personality, different types of companies are looking for different types of candidates. “For example, at a more formal company (i.e., a bank or law firm) a big personality and sense of humor might not go over as well as it would at an ad agency,” Hichens says. Make sure to do some corporate culture research to see how your social skills fit into the picture. It will save time and energy for both parties involved and help you get closer to the job that is best for you. It’s also important to learn more about the social dynamics of the specific team you are applying for. If your interviewer says that communal efforts are critical to the team’s success, your independent work habits may not be considered a big . 8 You had a less-than-positive attitude. Hichens notes that being rude or having a bad attitude can be a huge red flag in the first interview. Avoid badmouthing your current company or manager/peers. Treat everyone you encounter at the company – whether it be the front desk manager or the CEO – with friendliness and respect. It definitely won’t go unnoticed.